Home > Medication > Is Caffeine a Cause or Treatment? For those who suffer from headaches, especially frequent ones, it is important to understand just how caffeine can impact their headache frequency and intensity. There is a great deal of debate among experts about the benefits and negative effects of caffeine and this can be confusing to headache sufferers. Caffeine has a range of effects on the body, one of which is the narrowing of blood vessels, which then restricts blood flow. Since blood vessels are thought to expand at the onset of headaches, it is thought that caffeine's vasoconstrictive property eases the pain of headaches and migraines. Caffeine is also believed to increase the effectiveness of many pain relievers, and is therefore added to various headache medications. It would then be logical to suggest that less pain reliever would be required to obtain the intended benefits of the medication. Since some medications can cause gastrointestinal distress, a lower dose that is still effective would be particularly beneficial, and more so for chronic headache sufferers who require long-term medication use. Studies have suggested that over-the-counter medications may be as much as forty percent more effective when caffeine is added. Generally, most individuals will find that they feel the effects of caffeine approximately half an hour after ingestion and these last for anywhere from three to five hours. Caffeine can, however, also cause some unpleasant feelings such as restlessness, headaches, dizziness, shaking and insomnia. 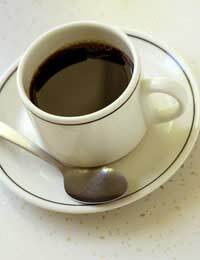 In addition, caffeine stimulates the heart and raises metabolic rate. It is at higher doses that the unpleasant effects of caffeine are more likely to occur. There is disagreement among experts regarding the exact amount of caffeine required to induce withdrawal symptoms. Your own personal tolerance can vary in comparison with someone else and age can also play a role, as metabolism of drugs changes as we age. The average person can expect withdrawal symptoms to occur after consuming approximately 500mg of caffeine per day, which is equivalent to about five cups of coffee. Others may, however, still experience withdrawal from as little as 100mg of caffeine daily. Based on research to date, it would appear that mild to moderate doses of caffeine in medication are helpful in easing headache pain. If your medication doesn't contain caffeine, drinking coffee and consuming caffeine-containing foods or drinks in moderation shouldn't cause unpleasant symptoms or withdrawal effects. If you are pregnant or on any other medications, your caffeine intake should be monitored more closely; it is wise to speak with your doctor if you have any doubts about how much caffeine you may safely consume as well as how caffeine consumption will affect your headaches. The key to remember is that caffeine can be present in various foods such as chocolate, which is linked to migraines, so some caffeine rich foods may also have compounds that can exacerbate migraines. It's also important to monitor your daily intake of caffeine and to be aware of the differences in caffeine content between a cup of coffee brewed from one restaurant to another. Some 'coffee shops' will serve a cup of coffee that is double or triple the caffeine content of another one and you could be ingesting a lot more caffeine than you realise, resulting in headaches and uncomfortable shakes and stomach upset. So a cup or two of coffee can help your headache but if you overdo it, you may be setting yourself up for more headaches than you started with.